Directional Microphones: Applies preference to sounds in front of the wearer and reduces amplification of sound from behind the wearer. Directional microphones are a proven method of improving speech understanding in background noise. Noise Reduction: Suppresses unwanted background noise. 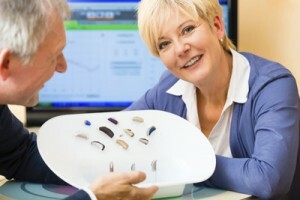 Background noise becomes less apparent and hearing aid wearer’s listening comfort is improved. Feedback Management: Reduces or eliminates whistling that can often occur with hearing aid use. Multiple Programs: Allows for unique settings within the hearing aid for different listening situations. Wind Noise Reduction: Reduces the noise created from wind blowing across the hearing aid’s microphone(s). Data Logging/Learning: The ability of the hearing instrument to track and learn the hearing instrument wearer’s preferences in various listening environments. This information can assist the audiologist in making future programming adjustments and allows the hearing instrument to adapt to the wearer’s preferences. Bluetooth Interface: Establishes a wireless connection between hearing instruments and Bluetooth compatible devices. This allows the wearer to connect cell phones, MP3 players, television, and computers to their hearing instruments. These features are available in different technology levels offered by a variety of manufacturers. At ENTAA Care we work with the following manufacturers: Bernafon, GN Resound, Oticon, Phonak, Rexton, Siemens, Starkey, Unitron, and Widex.